September 28, 2016 – Each time a rocket blasts off to deliver a primary payload into space, it typically does so with room to spare — a reality that got NASA engineer Joe Burt thinking. Why not exploit that unused capacity and create a sealed, pressurized, thermally controlled capsule that could take advantage of rideshare opportunities while accommodating less-expensive, off-the-shelf instrument components typically used in laboratory-like settings? Several years in the making, Burt and his team at NASA’s Goddard Space Flight Center in Greenbelt, Maryland, now are ready to validate portions of such a system. Called the Capsulation Satellite, or CapSat for short, the system is a hockey puck-shaped structure that measures roughly 40 inches wide and 18 inches tall. Purposely designed as either a stand-alone system or stacked depending on payload needs, each capsule is capable of carrying about 661 pounds of payload into orbit — a microsatellite-class weight not accommodated by the increasingly popular CubeSat platform whose instruments typically weigh two to six pounds. 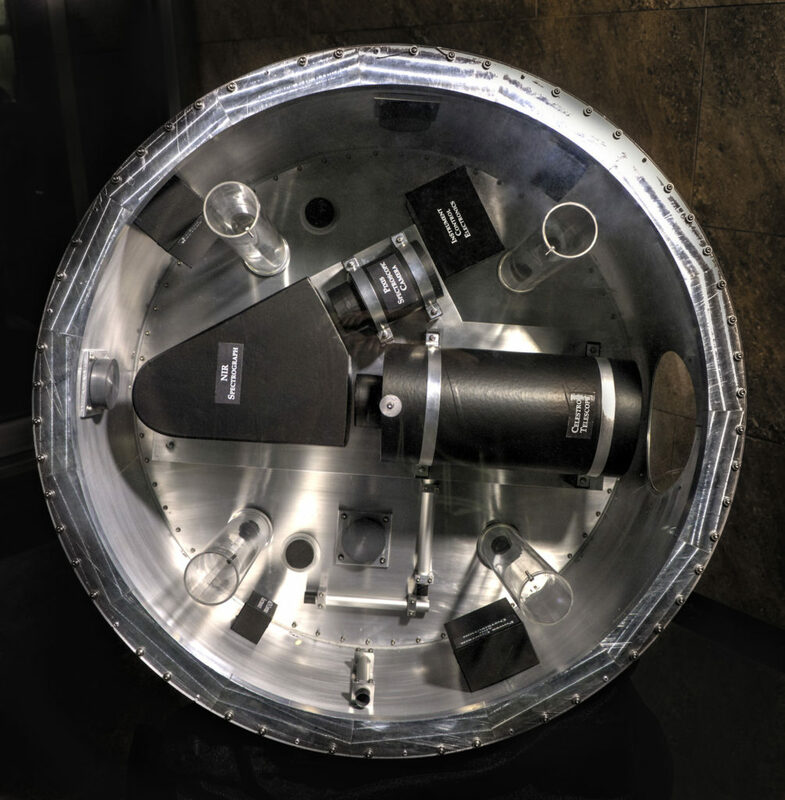 With funding from NASA’s Earth Science Technology Office, or ESTO, Burt and his team will validate CapSat’s all-important thermal-control system in a thermal-vacuum chamber test in late September. The system uses thermostatically controlled fans — much like those used to cool electronic equipment on Earth — to circulate air over hot and cold plates located inside the craft. This maintains a constant temperature where instruments would experience little, if any, thermal degradation while on orbit, Burt said. Under the ESTO-funded effort, Burt and Goddard detector expert Murzy Jhabvala also are conducting a study to scope out the specifics of flying a next-generation photodetector camera on a CapSat. The idea is that NASA could fly the detector on a constellation of CapSats to gather multiple, simultaneous measurements. To show the concept’s feasibility, Jhabvala successfully installed in late July a laboratory version of his Strained-Layer Superlattice Infrared Detector Camera inside the CapSat model. “The main purpose of the camera demonstration was to show how easily a laboratory-based instrument could become a flight instrument, complete with flyable electronics and software connecting it all the way back to the ground data display and analysis,” Burt said. What distinguishes CapSat is the fact that the capsule can accommodate heavier payloads. Perhaps more important, Burt specifically designed it to take advantage of a U.S. Air Force-developed secondary-payload carrier called the Evolved Expendable Launch Vehicle Secondary Payload Adaptor, or ESPA ring. Working with Moog CSA Engineering, of Mountain View, California, the Air Force created the ring to accommodate as many as six payloads beneath the primary spacecraft, exploiting the thousands of pounds of unused cargo space on many rockets. Goddard’s new Rideshare Office estimates that between 2015 and 2023, NASA will launch a number of missions whose total combined unused mass-to-orbit will exceed 46,300 pounds. “At an average launch cost of a million dollars-per-kilogram-to-orbit — even CubeSats cost about that — hundreds of millions of dollars in launch-vehicle costs are going unutilized,” said Bob Caffrey, who heads the Rideshare Office. “There really needs to be a paradigm shift,” he added. In sharp contrast, Burt estimates that CapSat would reduce today’s launch costs of $1-million-per-kilogram-to-orbit to just $50,000-per-kilogram by using a pressurized volume to take advantage of the unused capacity. Also to consider, he added, is the fact that since its initial development in the early 2000s, the ESPA ring has become the de facto standard for secondary payload carriers, with a growing list of users and opportunities. In 2009, NASA used the ESPA ring to deploy its Lunar Crater Observation and Sensing Satellite, which flew as a secondary payload on the Lunar Reconnaissance Orbiter. Private industry uses it, too. Late last year, SpaceX, of Hawthorne, California, used ESPA rings to mount 11 Orbcomm OG-2 communication satellites inside the Falcon 9 rocket, resulting in a successful deployment. In the meantime, the U.S. Air Force has announced that it plans to fly the ESPA ring on all future launch vehicles. It also has developed a process for selecting potential rideshare payloads and is creating other versions of the carrier to accommodate a broader range of users. NASA, too, plans to take better advantage of the unused cargo capacity and will be providing rideshare opportunities on its future missions, Burt said. “Secondary payloads are part of growing trend toward the increasing diversity of platforms used in pursuing space and Earth science,” said Greg Robinson, NASA Science Mission Directorate Deputy Associate Administrator for Programs. “Today, many U.S. government, academic, and industry partners are looking for ways to use secondary payloads as platforms to enable science, mature technologies, and enable workforce development,” he added. Given this confluence of events, the time is ripe for NASA to develop a platform like CapSat, Burt said, adding that Goddard’s Strategic Partnerships Office now is pursuing a patent on the CapSat technology. Not only is it compatible with the ESPA ring, it also is capable of carrying heavier instruments, even those originally built for a terrestrially based laboratory testing. Such a platform, which Burt believes industry ultimately should manufacture and offer at competitive prices, would significantly reduce mission-development schedules and costs. Since CapSat’s roll out, a number of possible new missions have approached Burt about possibly using the platform. One of the more promising opportunities, he said, is flying a debris sensor called DRAGONS, which is short for Debris Resistive Acoustic Grid Orbital Navy-NASA Sensor, on as many as four CapSats. Furthermore, Burt also is developing a smaller CapSat-type platform, which he calls the CapSat Science Instrument Tube, or CapSIT. In this architecture, the pressurized volume for the CapSat science instrument is reduced to a tube about three feet long and one foot wide. Robinson agrees. 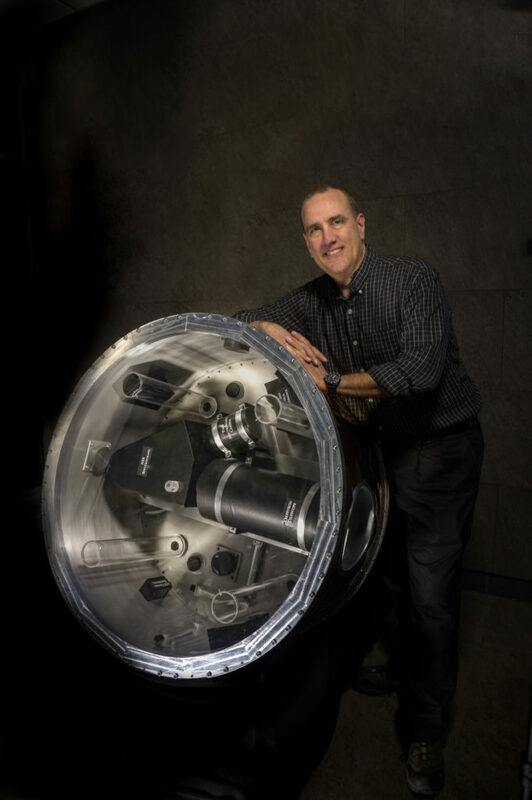 “It’s exciting to see what is being built by the Goddard team to provide researchers a capable and reliable platform for fast turn-around, lower-cost payloads,” he continued. “When combined with the wide array of launch opportunities for these secondary payloads, the opportunities for platforms like CapSat are showing real promise,” Robinson said.